Sandy arrived on the 7th of June. (I flew in commercially on AA, since it's an 8 hour trip in my Beech Bonanza (V-tail) - yep, sure is better to fly myself.) It is always great hearing her southern accent. Dallas meets Massachusetts (I'm still getting used to all the "pockin the cahs") to fly this beautiful country. I like the sound of that. Bob brought his camera for some neat photos. Friday - I finished up on some items and we did all our shopping for necessary essentials, including some survival items (when you fly remote areas and are packing survival gear food, it's amazing what you'll buy at Walmart). Even though I do not want to admit to any unusual events while flying this country, it is inevitable to plan for all possibilities...(I am blessed to fly with another pilot who likes to stay alive!). We have been reviewing the charts, (and there are lots of charts!). It looks like Saturday is awash. But, there may be a window of opportunity Sunday. So, I think we will pack the plane, finish the charts and enjoy sunny downtown Mansfield this evening. Don’t panic mom, it was for use of the necessary. Thank you, gentleman and sometime we may fly back to do some glider flying. While there we also visited with my brother and his wife - Josh & Edmund, too. I took a wild ride in the BMW that Josh had purchased recently. Nice car, Josh. Sorry I am rusty driving standards. They are a great couple of kids. We met so many great people there from different areas, many of who signed our traveling scarf. (Yeah………..Mac would strike up a conversation with everybody and their dog, and wouldn’t let them go till they signed the scarf!). It is so nice to have so many people that are connected to our trip across this beautiful country. Thanks to all the wonderful people we met. We then left for a flight over Niagara Falls, NY. It was great to see such a force of water over the falls from the sky. There was a military TFR to the south so I did not push playing around over the falls for too long. We then went to Lancaster – Buffalo, NY. Again, we met some nice people that helped move our big bird to the fuel pump. I would still love to know why the fuel is so much cheaper there, because everyone was flying in from all around to fuel there. Again, we had the pleasure to meet more pilots and retired pilots. There was also a wonderful older gentleman sitting in his van watching aircraft land that used to be co-owner of the airport way back when. He doesn’t fly anymore but sure enjoys sharing his adventures with transient pilots passing through. 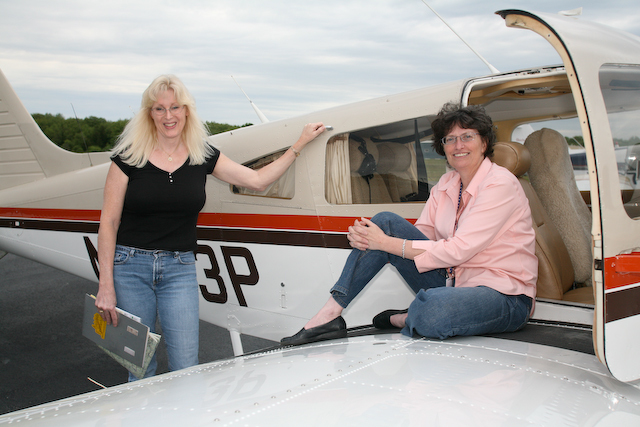 It’s amazing what you can learn from some of the fellow pilots who have so many memories to share. Many thanks! Then we flew across Canada non-stop to St Claire /Port Huron, Michigan on the border of Canada. It is such a pretty area flying over the land which is loaded with lots of farmland. Not that much different from the USA from in the sky. Canada has its own patch quilt that pieces itself together as well. We did not have to check in at customs. By that time, we were both tail dragging, babbling from weariness, and ready for a hot meal and good night’s rest. Sandy & I toured all over the island in the past 2 days. We took a tour to the Butterfly Farm, where they raise thousands of beautiful species of butterflies in an enclosed glass walk through conservatory. Another stop was the Stone Arch, where wind and weather has carved out a natural rock formation resembling a stone archway on the western shore of the island. Next was the Grand Hotel, a majestic white columned hotel where many notables, presidents, stars and such have visited. It was also the main setting for the movie “Somewhere in Time” starring Christopher Reeve, and has the longest front porch in the world at over 600’. There is so much history on this little island, walking the halls of the hotel, there are framed pictures of at least 4 presidents visiting this beautiful paradise. Historically, I believe it will hold it’s own in any part of this country. The state originally leased the land to individuals for a 100 years, which have been recently renewed at a nominal fee per year (per our tour driver). These homes are worth between $ 1 to 30 Million. WOW! While on a change over on the main tour to a larger carriage (which is referred to as the 747) with 3 Belgian horses we had Jason as our tour guide. He was our talkative guide and was very knowledgeable about the area. He is a 3rd generation horse handler and tour guide on the island and he hopes his son will be as well in another 15 years or so. Good luck to you both. Since the island runs with only horsepower, the sale of “horse apples” is a market unto itself. For 75 Cents you can by the next cheapest souvenir to take-home with you (the Town Crier newspaper). Any amount of horse apples that you want to take with you is free. We did not purchase any to take with us (didn’t have anything to do with weight & balance, mind you). The smell would be interesting in the cockpit on any given day that is hot (however, I find that that some of the things that Mac tends to try to “sell” me are amazingly similar in nature!!!). Sandy took tons of pictures and fell in love with one of the homes close to the water. Wait until you see the photos of the island and our tour. Again we met lots of great people from all over the country. This morning we where up a little late, we did over sleep in just a little. We have been eating at places like the Good fellows, Pancake house and Chippewa Hotel. The food has been excellent and of course we polished the evening off with an ice cream cone. This area is known for lots of fudge, but we held out for the ice cream. Mackinaw Chocolate is great on a chocolate cone. I find it amazing that we get along so well and work pretty well together as a fly team. Well, tune in for our next adventure and the photos when I am able to download through the wireless. We do not have a good internet connection here on the island, so we will have to find one in Minneapolis, MN tomorrow to start our site moving on this latest adventure. Sorry for the delay, we are working on it and having a great time meeting so many wonderful people across the USA. Maranatha ! Pictures to follow. Pilot had the wrong settings on her camera. We made it across to Minneapolis, Minnesota to the Mall of America. What a place that is! The Mall of America is now considered the number one attraction in the USA today. I can see why! There are so many stores with such a diverse variety you can not possibly cover that place in one day. Since Sandy and I were more concerned about getting the photos down to the webmaster so that everyone can see the great time we are having, I made a beeline to Ritz Camera. There are so many photos that it took longer than planned to copy to disc. So, Ritz Camera was gracious enough to mail the copies to our wonderful fellow in New York working on the flying nonny site! Thanks Warren for being so patient and doing a good job! I know I drive you nuts on occasion (Warren, we have a lot in common!-just kidding, Mac….you know I luv ya!). As a side note: I forgot to mention Sandy was feeding the seagulls in Mackinac Island and it was not a good thing because we both found out that they have been known to attack people who did so. Why I bring this up, you may ask, is because I have some nice photos while she did the deed. Including a nice one with her pointing to a sign we found at the Butterfly Conservatory that says “DO NOT FEED THE SEAGULLS.” It was kind of neat thing to watch and how they communicate so quickly over food. (Mac is one to talk about communicating over food – I’ve never seen anyone eat so fast and talk the whole time! As for the birds, I plead guilty. They would swarm all over, and one would literally sit patiently for me to break off a piece of graham cracker and feed him. He acted almost like my little dog Yewbee, just sitting and looking at me with big gull eyes until the next tasty morsel came his way. They were so unafraid of humans – I guess the desire for food overruled all inhibitions – kind of like me around snow crab legs! ). The Butterfly Conservatory was beautiful ! So many butterflies floating around, it reminded me of the one we have in Grafton, MA. If you have not been there, you really should go, it is quite the experience. We departed the next day and as we flew along the country to Minnesota, we made a stop in Rhinelander, Wisconsin. There we met Merrill, he was nice enough to let us house the plane in his hanger overnight so it would not get beaten up by the storm that was coming in. I guess that area gets some interesting hail and I did not wish to let my baby get dented. Thanks Merrill ! We Departed there and made our way to Minneapolis, MN and the wild trip around the mall began. We did not have time for the for the rides, but I was able to get some great shots of the inside of the Mall. Sending these photos as I write the update for the journal. Hold : Sandy is taking photos as I blog away for the traveling site. Okay, I am back ! Still in Sioux City, IA, it turns out there is a starter problem that we must take care of. Steve & Bob have helped us out. Steve had the part right next door at West Jet As Sandy would say, the lord has blessed us again. Thanks Steve & Bob for all your help. PS: I really appreciate the help Steve and again it was good to see you and I think you are right. Every time I see you something goes wrong with the plane. Sorry handsome, I hope next time it will be better. And I hope your trip to Lock Haven went well and the fishing trip on the Delaware is great. Sandy and I took a trial run in the old bird after repair and she was fine, but the airport pattern was very busy with jet traffic, so, we landed and went to sight-see a little. We found an interesting monument near Steve’s house that marked the grave of a sergeant that was with the Lewis & Clark Expedition back in the 1700’s. It’s an obelisk, about 100’ tall, and resembles the Washington Monument – out here in Sioux City. I can not picture myself trekking through some of the terrain that must have been around then. A violent weather front with extremely gusty winds and heavy downpours came in and provided a great reason to stay another night. See photos. We met some nice couples downstairs in the hotel lounge; there for the biker weekend was Steve, Susan, his brother and his wife. Nice people from the area. Happy Riding! Dana, a young gentleman, escorted me to a night on the town to enjoy the biker weekend. I took lots of photos of the bikes downtown. There were 3 bands playing at different locations, with motorcycles riding up and down the street. They tell me this biker’s weekend is a smaller version of Sturgis SD or Laconia, NH. I had a great time roaming around with Dana. Good luck on your up and coming nuptials. I wish you both the best and give my best to your mom. We left for Rapid City, SD. We arrived early in the morning and proceeded to settle in and plan our sight-seeing agenda. While doing this we met Jeff & his brother who had been riding their bikes from Chicago area. They are two traveling brothers that were outside the hotel while we where checking in. It was good hearing from you on are email and glad you made it back to Chicago. We hope to hear from you again about your adventures as well. The next day we went to Reptile Gardens where we had the great fortune to meet a famous movie star and his lovely wife. The star was James Whitmore and Noreen Nash. Thank you so much for the photo and your autograph on our traveling scarf. We tell everyone we met you and they all think you are both great. (Mr. Whitmore, remember that there’s no such thing as luck – God is ALWAYS on His throne! We’ll be watching for your new movie coming out). The Reptile Gardens was also interesting because there was alligator that starred in the James Bond movie, no autograph there. Like, DUHHH!!!!!) Snakes, frogs, lizards and a few interesting birds. There was even a show on how to handle an alligator, not that I really wanted to try. (Like DOUBLE DUHHH!!!!!). We left there and went to Bear Country USA. (Mac keeps saying let’s go watch the “beeahs” - she’s sooooooo Bostonian!) You drive through this park area for $13.00 and you see real Elk, Bear, Mountain Goats and various other animals actually walking about freely. The photos will explain how close they are, but you must leave your windows up at all times, because they are that close. One area had no less than 10 baby bear cubs playing in an evergreen tree. They were running every which way, climbing and falling out of the tree, rough housing and chasing each other – they looked like school children in the way they interacted with each other. (The only difference was that they weren’t taking drugs, shooting at each other or studying about global warming). It was fantastic. Cosmos was next, the area of unexplained phenomenon where it appears that people and objects defy gravity by being able to lean over at absurd angles with the ground. Sandy and I figured it out. Not so grand. (Save your cash and go get a hamburger – this tourist trap is rated. DUDDDDDD!!!!). We left and went to Custer State Park and proceeded to Mt Rushmore. At least we thought we did, we were however driving all over Black Hills National Park. (Welllllllllll, …..I forgot the GPS for the car…….). It was still beautiful After our long beautiful drive we came back to the hotels and decided to make a plan for tomorrow. Which we did and we stopped at various areas for some of the nicest photos. We made a decision to fly over Mt Rushmore on our way out. Thanks Dwight for checking the plane out and giving us such great advise on our travels further west. Mt Rushmore was beautiful even from the air. and we lived to fly another day!). There hills (see above comments about Bonanzas.........). We have had a bit of a friendly banter throughout the trip. been even more enhanced with you penning your words of encouragement for us. Thanks again. We rested in our little log cabin out back behind Holiday Inn - Wait until you see the photo. was and yet he died broke. Too many failing business adventures I hear. least it seems in some things. We proceeded to "Old Faithful" and almost like clockwork she went off to at least 75 feet. always in awe of the gentleness and spirit of all the people we meet. Maranatha! Arriving in Santa Fe, NM early in the morning left us to do some sightseeing early. Sandy & I started our tour with a ride around the downtown area. I find it hard sometimes to realize it is a city. Not as big as the city of Boston, but it has its own charm. We drove up and down the streets of Santa Fe, NM and what a sight, there were stores and Indians hocking their wares in the park. There are very few Indian tribes that exist in the area today; there are about 16 tribes in existence today. The common area of Santa Fe allows the Indians to come and go freely with their goods to sell. So, you could buy different Indian hand-made items to take home in variety at anytime because they change periodically throughout the day from one type of goods to another. We decided to eat at the hotel that evening, as well as a trip to the Indian Flea Market off the highway. The Indians have an area with their goods off the highway only open on the weekends. So, we rushed down there to see some interesting items. The cost of jewelry was cheaper there. I promised my sister to find a necklace that would be turquoise. But, I learned there is no more real turquoise available any more. A lot of our production is in China, I was surprised to hear that. I guess it is to expensive today. The hotel we stayed at close to town was the Hotel Santa Fe; they had a real purple London Cab to take you downtown or to different locations in the area. It was easier than parking downtown. There was a Basilica built years ago, St Francis of Assisi that was beautiful at the end of the downtown. The church was beautiful! From there we went home and managed to get a restful night with a planned trip to Los Alamos. It was interesting to see where the atomic bomb was actually tested and the history of the housing unit that housed the people that lived in secret while the country planned such a historical unit that changed our country forever. I was not aware that these people where living in secret and they all where a working as a collective unit. There was only a small post office that they could communicate through for many years while this project was worked on. Sometimes, I feel that back then there was a clear sense of the countries interest to be protected by all working as one unit. Especially while walking through the museum that depicted their lives and living quarters. There was one common goal. I guess with every invention there is a positive and a negative, but so much more has been learned from that one area that has continued to benefit our country in many ways. From there we went to other areas to see the country side. This country is so diverse in its landscape. From the area of Santa Fe, NM it ranges from a baron and often sparse looking areas to a rolling area in between the towns. Homes are built on slanted areas in the small hills from small to larger homes. I took lots of photos again. We also toured Canyon Road, which has 250 artists and the 3rd largest art gallery area in the US. New York and San Diego I think are the first two. The art ranged from Contemporary to very refined. It was very interesting especially with all the statutes around that depict children, Indians and animals in Bronze. I found that there is a foundry nearby that they make all these statutes. There are also certain days that allow you to visit and see them made at the foundry. Sandy & I realized that we could not fly into Dallas, TX area due to the severe weather. So, we decided that Sandy should get on a commercial flight from Albuquerque, NM to go home to Dallas, TX. It would be a lot safer than me flying into the area with my baby bird. I am also sure everyone heard about the heavy rain and flooding in that area of Dallas. It was all over the news and it was constant. It did not look like it would be stopping until sometime in the next week. So, Sandy left early the following morning and I stayed on for another day. My plane had a little problem while there and had to be looked at. Santa Fe Aviation took care of it and me w as off and running the following morning. While returning the rental car I forgot my camera. So, when I taxied out and departed I had to turn around and come back. The tower was great! I did my 180 and landed. I retrieved my camera at the car rental and then notified the tower of my second departure. It all worked out well. When I switched from tower to approach for flight following they asked if I was aware of the mountains. I told them yes, I guess they where concerned with by climb performance. I was told later that a lot of low-Lander pilots like me have a dangerous time over the mountains and they loose a few planes. A low-Lander is a flat land flyer that does not have experience over the mountainous terrain. I was surprised to learn they loose 3 to 4 planes a year due to the inexperience through the mountains. That is enough to give any pilot pause. I am so glad I am a cautious and conscientious pilot and aware of the density altitude conditions in relation to the performance of my plane. I had decided to fly into Amarillo, TX because it was at the low end of the hills, I am glad I have the terrain avoidance unit to double check the ground clearance and antennas that are around the area. I landed and was checking weather and did not realize that there was a team of military jet pilots that had come in from Manchester, NH. I discussed weather with them and realized that the best route would be farther north to avoid any of the weather from the Dallas area. That was interesting to be able to discuss weather with the pilots of the military jets. Sandy lent me her Garmin that depicted the weather; it did make it easier to be able to follow weather. It did help me out to avoid some of the weather and it gave me the winds at various levels, so planning was a little easier while flying. From Amarillo, TX I went into North Platte, NE where I spent the night. There I met Bill Engrail the comic from Blue Collar Guy. He was a really nice guy and he signed my traveling scarf and poised so nicely in front of his jet. See photo on the site. I then ran into a few guys that needed a few extra charts, so I gave them my extra charts and wished them well. Hi guys, I hope the trip to San Diego went well. North Platte was a nice place. I then went via Red Oak, IA, I spent the night there and it is such a beautiful town. I felt like I was on the set of Back to the Future when I was downtown. I met some really nice guys at the airport and I am sorry I blocked the gas pump. Thanks for the help with the courtesy car and the nice hotel for the night. You guys where great. What a trip! I spent the night there because my mom and dad where worried and very upset that evening about me flying alone. So, I did not want to upset them so I spent the night in Red Oak, IA. I was really worried about them being that worried, so I called and confirmed that I was grounded. I planned a really early tomorrow, so I went to bed early. I departed around 7 AM and I continued to cruise the friendly skies to a couple of more stops and ended around 5 hours to Findlay, OH. I decided to go another hour so I stopped in Clarksburg, WV to see my grandchildren. They where glad to see me and I was tickled to see them also. They are growing so fast. I was up and out the next morning with a stop in New York and home by 1:00 PM on Tuesday. I was tired with lots of flying. I took lots of pictures until I ran out of space on the flash card. Close to 53 hours of flying in 3 weeks and 2 days. What an adventure flying the country has been. I have been collecting signatures on the scarf and meeting lots of wonderful people. Come Swing under the Stars with us to help raise money to promote the Mansfield Air Race of 2008. This is the fundraiser that will help us bring the girls to our own home town in 2008. 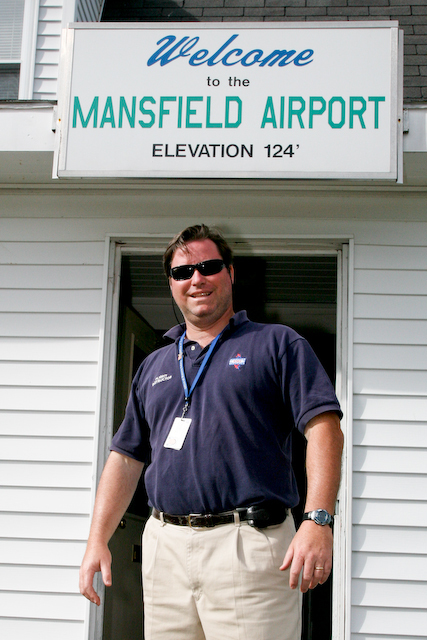 The Mansfield Air Race Committee invites you to share in our evening together at the airport. Again, I look forward to seeing you all there.